Millions of Americans are victims of crime every year. While overall crime rates are dropping, having your home or personal space violated is always traumatic, and some crimes can be quite costly. 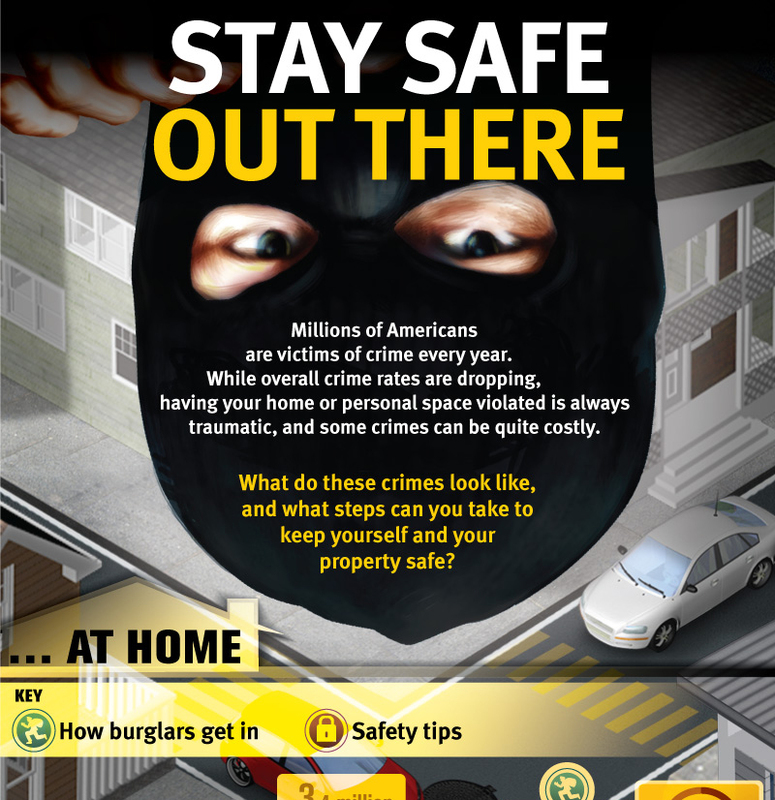 What do these crimes look like, and what steps can you take to keep yourself and your property safe? - Annual home burglaries in the U.S.
- Keep exterior doors free of rot, cracks and warping. - Use deadbolts on all exterior doors. - Avoid keeping a spare key outside. - Make sure pet doors are as far away from the door lock as possible. - Ensure lights are installed on the exterior of all sides of the house. - Leave some lights on when you're away. - Maintain sightlines of entrances by keeping shrubs and trees trimmed. - Cut the lawn regularly. - Buy a dog or a "Beware of Dog" sign. - Walk in groups whenever you can. - Avoid alleys, vacant lots and other secluded areas. - Walk on the sidewalk, avoiding doorways, bushes and other potential hiding places. - Walk at a steady pace and don't stop to talk to strangers. - Don't burden yourself with too many packages or items. - If you're wearing headphones, don't turn them up so high you can't hear outside noises. - Never leave the keys in the ignition when you're away from your vehicle. - Look around and inside before getting in your car. - Roll up the windows and lock the car, even in front of your own home. - Don't leave valuables in plain view. - Remove GPS devices and smartphones. - Park in busy, well-lit areas. - When leaving your car for a valet or repair service, give them only your ignition key. - Have your keys ready before you reach your car.